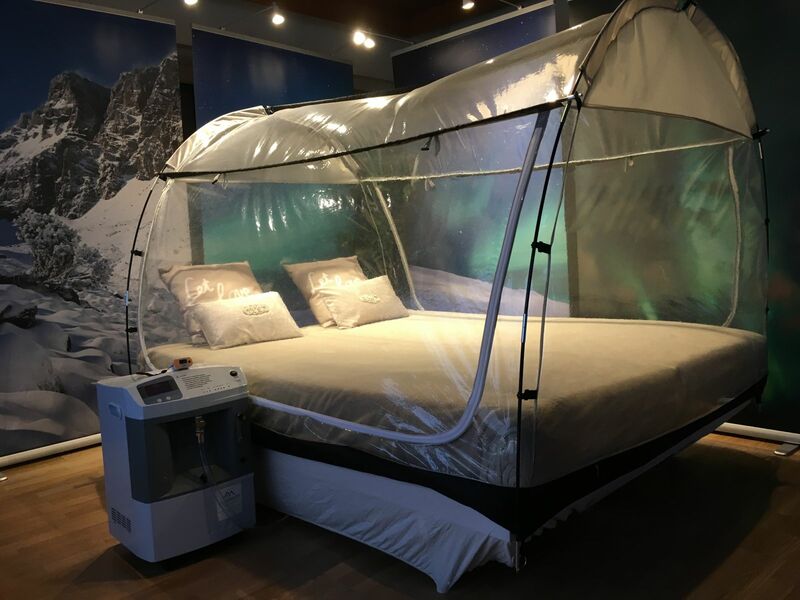 OXYGEN TENT WITH HYPOXIC GENERATOR FOR ALTITUDE TRAINING. * For the improvement of oxygen transport and oxygen uptake by production of extra young red blood cells. * Improving the immune system, metabolism and fat burning. * Improvement of endurance and performence. * Better recovery after training and contest or after injuries. * Less chance of altitude sickness for mountaineers. Rental price € 125 / week ( with a minimum of 4 weeks ) including VAT. Transparent bed tent + height generator + Pulse oximeter. Purchase € 3850 ( Luxury tent + generator + Pulse oximeter ) including VAT. * Transparent bedtent with dimension L 200 cm x W 180 cm x H 130 cm fit on a bed with single or a queen size mattress inside it. * 15s Transparent windows and finish above with special type of Nylon, with necessary transit with closure for hoses and cables of battery charger of mobilephone, smartphone or lap top. * Floor 150d Oxford Polyester for mattress. * Very easy to set up and back to store. * Digital display adjustable between 0 and 6500 meters altitude. * Dimension 365 mm x 375 mm x 600 mm. Weight 27 kg. Less than 43 Db. sound. * AC 220 V * 480 watt. * Internal filters for clean air, supply hose to oxygen tent. * Alarm in case of power failure, low and high pressure alarm, temperature alarm. * Oxismarter with Oled display for heart rate and oxygen measurement.